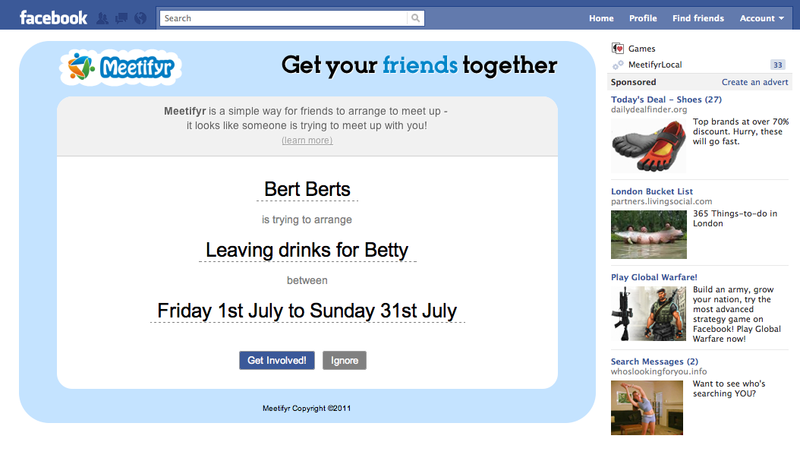 We've made a few changes recently to make it even easier to get your friends together. When creating a new event we now ask if you already know when your event is happening or if you need help picking the best time. 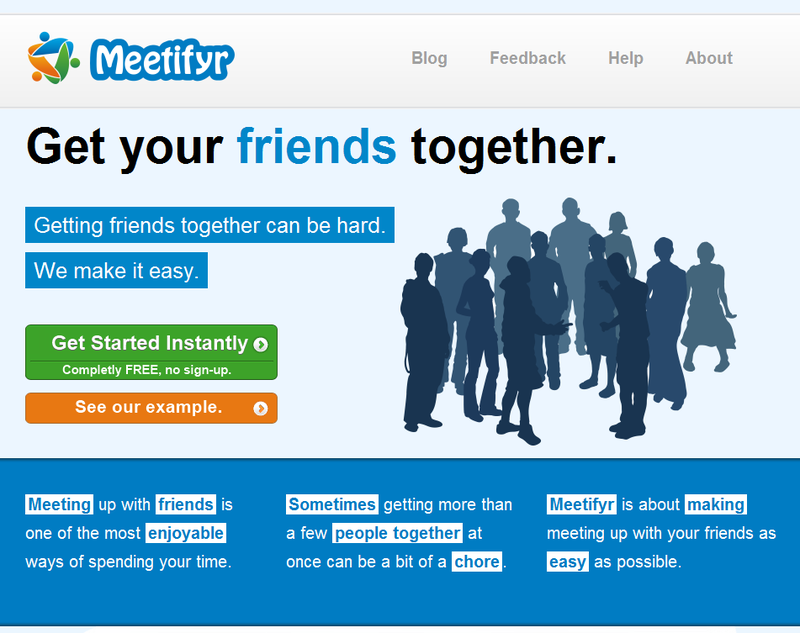 Even though Meetifyr was originally created to help people find the best time to meet with friends we noticed it was also being used to see who was available for events on specific days. We then ask for the date or date range the calendar needs to cover, previously we just assumed the next four weeks - but it turns out this assumption was rarely correct! We hope these changes will make it even easier to get started with Meetifyr especially for new users. We've given the Meetifyr homepage a bit of a redesign and as a part of that we've added a Facebook Like button - so if you like Meetifyr we'd really appreciate if you click it! It's just as important for us to know if you don't like our site, if there's something you'd like to tell us about please, please let you know by email or visit our feedback forum. 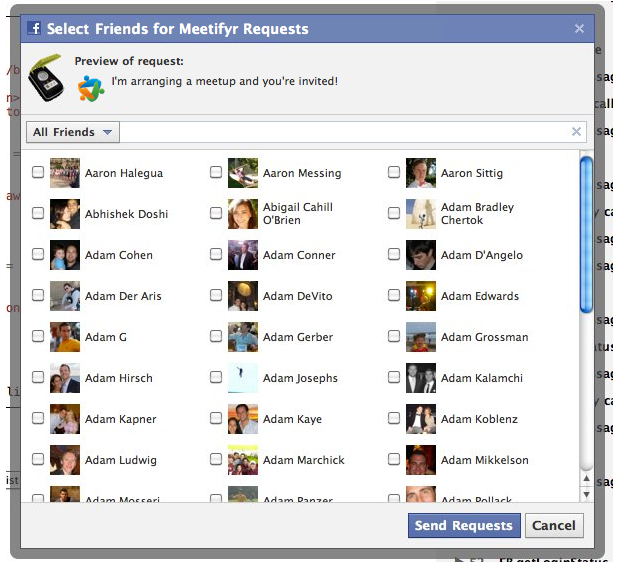 We've made it even easier for you to invite friends to a meet up with Facebook invites. 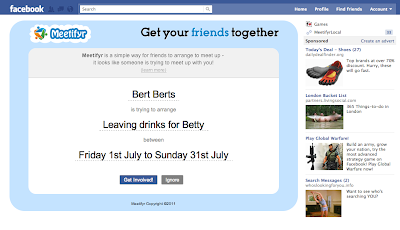 Now from any event page you can get a list of all your Facebook friends and select the ones you want to invite your event. Just click the Facebook login button to get started. 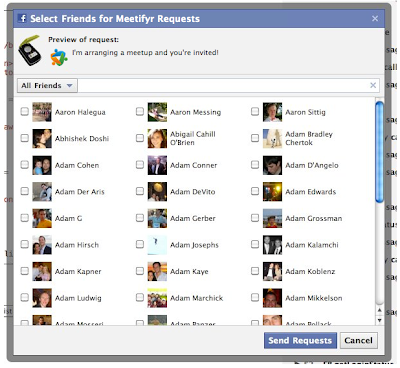 Once you've select your friends and clicked Send Requests, all those friends will receive a notification through Facebook asking if they want to get involved in your event with and a click of a button will bring them to your event in Meetifyr. Previously with Meetifyr when an event was updated anyone else looking at that event wouldn’t see the update until they refreshed their browser. This is fine with only one person updating an event but not so great if multiple people are using it. With this latest update to Meetifyr we’ve added realtime updates, if several people have an event open and one of them makes an update, everyone will see that update instantly without refreshing the page. 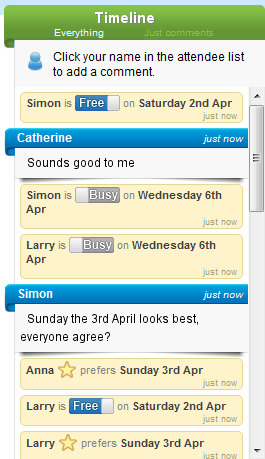 This also works with comments which makes them into a more real-time chat, great for when you’re trying to organise something! To make it obvious when an event is updated and to give a clear overview of what’s gone on we’re replaced the Chat and When’s Best tabs with a single Timeline area which combines updates to an event with any comments. This updates in real-time and is a great place to look to see what’s changed since you last looked at an event. These changes, especially the real-time updates, were quite technical so watch this space for a follow up post on how we did this with the Google App Engine and their Channel API. There's been an area on Meetifyr for a while which shows the days for your meetup. This was a little hidden out the way, behind the comments section, so today we've put three little pointers which show the top three most suitable days for your meetup based on everyone's availability. As days get selected as unavailable or preferred the pointers bounce around to keep track of which days suit people best. And if you need to choose between the 1st, 2nd and 3rd choice, well that's what the comments are for! Today we’re very excited to annouce the launch of a redesigned Meetifyr! After working away behind closed doors for months its time to show our new look to our most honest critics, you. We continue with our aim of being the simplest way for friends to arrange to meet up. 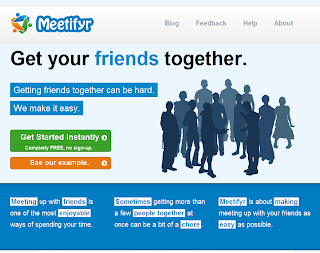 There’s still no logins, passwords or email addresses to remember just a simple page where you and your friends can share just the information you need to make that meet up happen. A little under a year ago Meetifyr launched and since then we’ve been steadily improving the site while a dedicated number of people have come to rely on our service. We hope the design changes we’ve made today will help make Meetifyr more enjoyable to use and open it out to an even wider audience. This is just the first step of a long process to improve Meetifyr so any feedback, good or bad, is most welcome. Thanks!